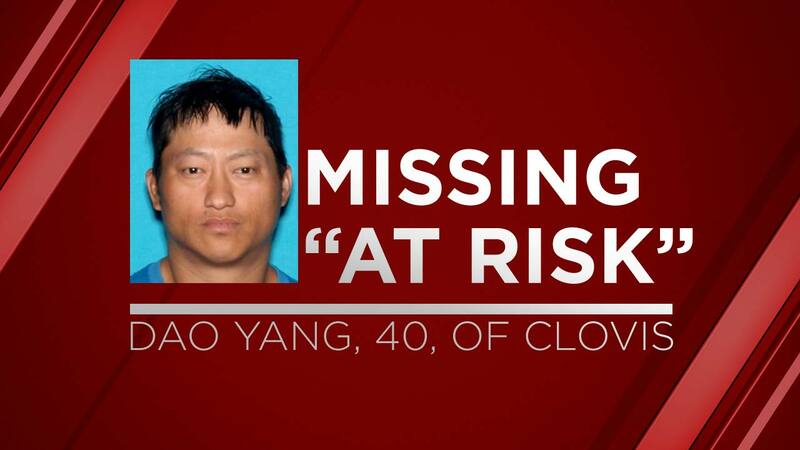 FRESNO, California (KFSN) -- The Fresno County Sheriff's Office are asking for the public's help in finding 40-year-old Dao Yang of Clovis. He was last seen at a home on Fowler Avenue north of Shepherd in the Clovis area. Yang was last seen wearing a black jacket, blue jeans, dark colored shoes and a camouflage hat. Authorities descibe him as Asian, 5'6", 160 lbs. with brown eyes and black hair. Yang has reportedly been diagnosed with diminished mental capacity and has other underlying medical conditions which require him to take medication. Yang is known to frequent the Walmart shopping center at Herndon and Clovis Avenues, as well as restaurants near Armstrong and Fowler Avenues. Members of the Fresno County Sheriff's Office are currently searching the surrounding area to try and find him.